From the US to Sweden and back and forth. A few days ago I dug deep into my reserve of Swedishness. I was looking for a bench to sit down on and eat my sandwich of toasted bread, butter, mustard, and ham. It’s a lunchtime staple for me here in Sweden. But to truly enjoy a sandwich of that caliber, you need a nice bench and some sunlight. As I walked out of the archive, I looked right only to see a man plop down on a sunny bench. I kept walking. There must be a bench around somewhere. How about the one near the church? Nope. One woman sitting there. The other one? Nope, an old lady sitting there. I kept walking. How about that stretch of benches in the park? Nope. One person on each of them. I kept walking. Everywhere I looked were sunny benches host to only one person. So I kept walking. Nearly a mile I walked until I found one. All to myself. A sun-smothered bench that was warm and quiet and the perfect place to eat my sandwich. And life was good. And I told myself that it was not strange at all to walk nearly a mile just to find a bench for myself because it meant I got a nice lunchtime walk in. Then it happened again. The very next day. Lunch that is. It tends to be pretty regular. Except this time, I was ahead of the crowd. I’m an adult. I can eat lunch whenever I want. I don’t have to eat at noon. So I found a bench in the sun. Big enough to probably fit four people. I sat to the far right. Hugging the railing really. It seemed rude to sit right in the middle and take up too much space. 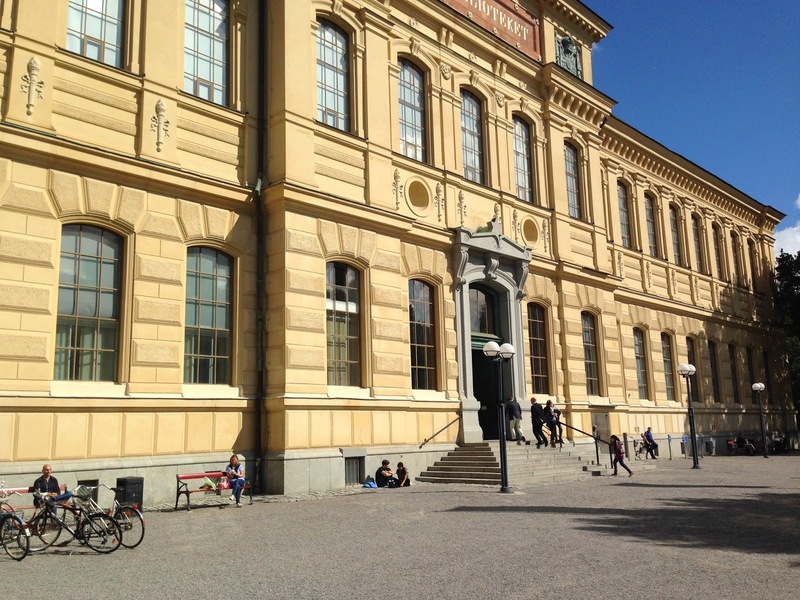 That's a not so good picture of the front of Kungliga biblioteket. Notice the benches. One person on each. Notice the ground. People sitting there. Probably to avoid sitting on the benches with someone else. I was listening to a podcast. Eating another sandwich of toasted bread, butter, mustard, and ham. Enjoying the sun before it slowly fades into darkness as winter comes closer. And life was good. But out of the corner of my eye I saw something. A man. A bike. I heard something pushing, jostling, forcing its way through my podcast. A voice. Damn it. The man was talking to me. Asking if there was room on the bench for him. And again, I dug deep into my reserve of Swedishness. This one a different reserve. This one the reserve that avoids confrontation. That is friendly and abiding. Absolutely, I said. What I really wanted to say was No. No there’s not. I found this bench fair and square. There are other benches out here that are open. That’s why I ate lunch early. So I could claim a bench to myself. Find your own bench. Because apparently, in the ten days I’ve been back, I’ve turned into a bitter old man. Of course, as those thoughts rushed through my head, he responded to them. As if he knew. Thank you, all the other benches are in the shade. Well-played, sir, well-played. We sat quietly and ate our sandwiches. He broke the silence to tell me about his cell phone problems. I listened politely and laughed at the right time. Smiled even. I’m very charming. He finally left in silence. I had outwaited him. The bench was mine again. But my happiness was short lived. Coming from the left again, I saw movement. This time a couple. A super Swedish, blonde-haired couple. Black tights for her. Backslick for him. The same. Exact. Question. Was there room on the bench for the two of them? Absolutely, with a smile. But I lied. There wasn’t room. This bench wasn’t big enough for the both of us. Let alone the three of us. So I drank the rest of my water, brushed the breadcrumbs off of my shirt, packed away my sandwich bag to be used another day, and left. Welcome to Sweden. And park bench politics. I'm starting to think that it's a Swede that invented the benches with a handle in the middle, creating a physical distance between two strangers forced to share a bench (and not a cruel person trying to make it impossible for people to turn the bench into a bed). This is too accurate. It's just so awkward and uncomfortable having to sit and eat lunch with strangers. Thankfully, I usually avoid the awkwardness by reading a book or listening to music or a sommarprat while sitting on the bench and eating. Tips från coachen! I was actually listening to a podcast and the one guy still got through to me. He was very sneaky. E-mail: aswedishamericaninsweden at gmail dot com. Want to help support the blog? © by author. All rights reserved. The work is meant to be shared, not stolen. Please don't steal. Awesome Inc. theme. Powered by Blogger.